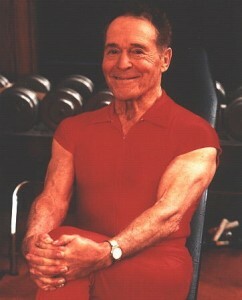 Jack LaLanne, a true trailblazer and champion for fitness, passed away on Monday at the age of 96. Because he is known as one of the founders of the modern fitness movement, I thought it was only fitting to devote a posting to him. For many of us, it’s hard to remember a time when fitness wasn’t a common topic of conversation – when people were not really sure if this idea of exercise was all that smart. But that time did exist. There was much hesitation. People didn’t quite understand exercise – and because of that, they were slow to recommend participating in it. Through Jack’s efforts, and the efforts of many others, those views have changed and exercise is something that is now recommended for nearly everybody. He was always doing things to show people what was possible if you were healthy and fit. Below are some of his greatest feats, highlighted from the Jack LaLanne website. I’m not sure I necessarily agree with everything he has to say, but there is no doubt that he was quite the inspiration (and character) and has left an unforgettable mark on the world of fitness.